Once considered one of the more arcane chapters of the Bankruptcy Code, chapter 9 – under which city or local governments may be eligible to file for federal bankruptcy protection and attempt to adjust their debts – is being used with greater frequency across the United States. From the West Coast cities of Stockton and San Bernardino in California to Jefferson County, Alabama, and Harrisburg, Pennsylvania, in the East, the use of chapter 9 – often considered a last resort to resolving municipal financial issues – has been increasingly utilized in an era of reduced tax revenue and underfunded pensions. 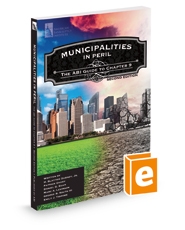 This second edition of Municipalities in Peril: The ABI Guide to Chapter 9 has been revised and updated to include coverage of the latest cases and offers insight into actions in such larger urban settings as Detroit. Including a convenient summary of all relevant state statutes, this guide is a must-have for bankruptcy professionals entering this burgeoning practice area, as well as for municipal finance personnel and counsel seeking detailed information about the fundamental issues of governance, credit and debt adjustment that uniquely surround municipal debt cases.